A limited colour and material palette help the Cube Education and Self-Study Centre, designed by Kaan Architecten, to blend with existing buildings on the Tilburg University campus in The Netherlands. 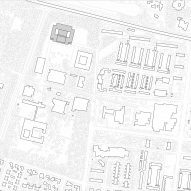 Rotterdam based Kaan Architecten has added the new building to the northwest of the Dutch university campus, which also includes the protected 1960s Cobbenhagen building by architect Jos Bedaux, named a national monument in 2015. 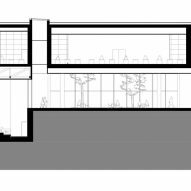 The brief was to create a multi-functional building where students, faculty and academics could meet and collaborate. 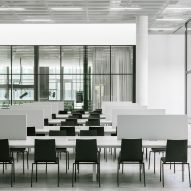 The resulting building, called Cube, has similar proportions to the Cobbenhagen building and provides 11,000 square metres of space for up to 2,200 people a day. 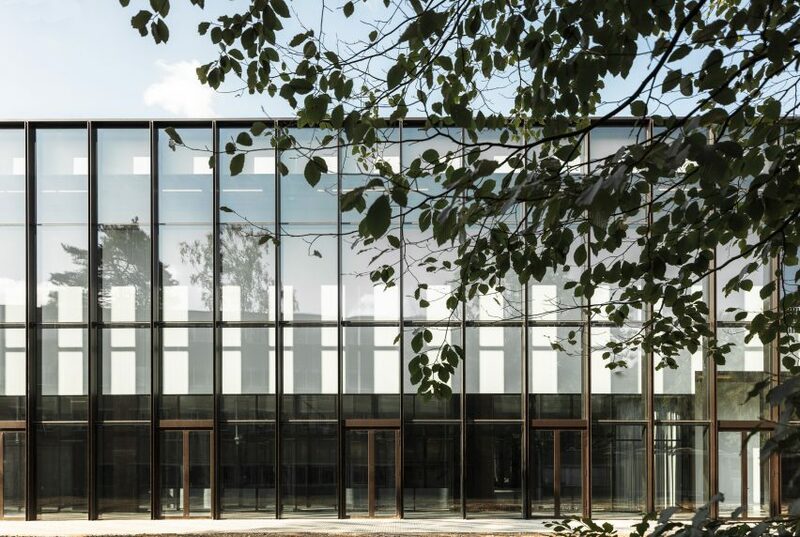 "The great thing about the Tilburg campus is the setting beautifully surrounded by trees, with the northern part of the campus being referred to as 'Het Bos' (the forest)," said Kaan Architecten project architect Timo Cardol. "It was very important for us to make a spacious building which has a free flow and many sight lines," he told Dezeen. 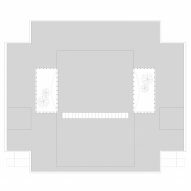 "Because of the many different users in the building, we wanted to create a very clear layout which is evident in the open plan and symmetry of the building." The structure is shaped like a squat cross, ensuring each of the facades has a unique view and appearance from the outside. The south facade, which faces the centre of the campus, is almost entirely glazed. "We developed a new U-shaped wing profile together with Schuco for the south facade, bringing scale to the building by framing the 60-metre glass facade," explained Cardol. 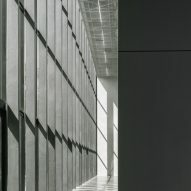 "The east and west facades gain the most sunlight, partially blocked by the deep vertical concrete lamellas," he added. "Due to the height of the rooms, the lamellas still allow lots of light and interesting views to the green outside. 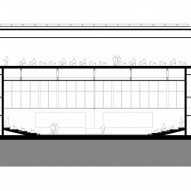 The northern facade is glazed and rather flat, emphasising symmetry between north and south." 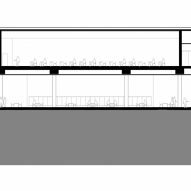 The ground floor is arranged around a large, open area, with two main entrances from the south side of the building. 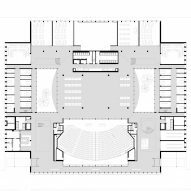 Two internal courtyards on either side of this space rise up through the entire height of the building and a glass-walled, 600-seat auditorium sits at one end. 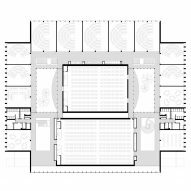 Independent study spaces with lower ceilings provide spaces for quieter, more focused work, and a series of lecture and tutorial rooms are arranged against the edges to the west, north and east. The building also houses a cafe, exam rooms and a virtual reality laboratory. A sculptural white staircase leads up to the first floor, with an additional three dark, metal staircases providing further access. Upstairs, the central space is given over to banks of desks, while lecture spaces and meeting rooms are again arranged around the edges. 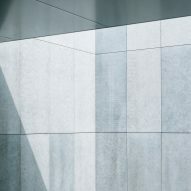 The architects chose to use a limited, predominantly grey and white colour palette for the interior, which is informed by the concrete and metal used for the structure. The aim was to make the most of the changing quality of the natural light provided by the extensive glazing of the facades throughout the day. 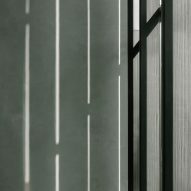 "The thin steel plate on the concrete columns has come out very well, as if a sheet of paper was put on top giving beautiful shadows," said Cardol. 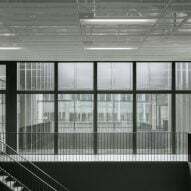 Based in Rotterdam, Kaan Architecten is led by architects Kees Kaan, Vincent Panhuysen and Dikkie Scipio. 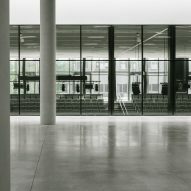 Its recently completed Utopia library and music school building in Aalst is among 21 Belgian projects nominated for this year's Mies van der Rohe Award for the best building in Europe. Main image is by Sebastian van Damme. All other photos are by Simone Bossi.